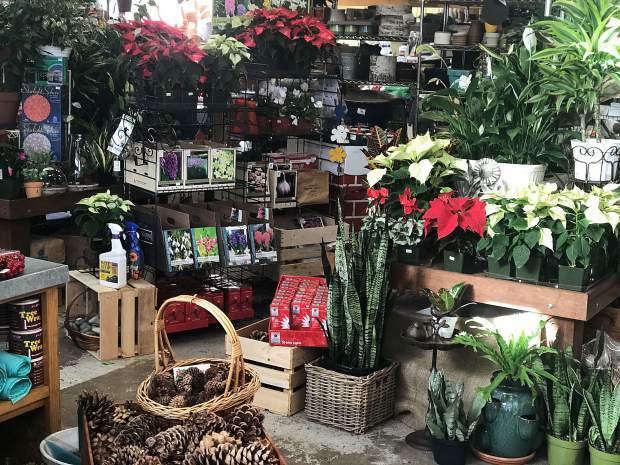 Head to Villager Nursery to find lovely gifts for your loved ones this season as well as some great plants to decorate your own home. Villager Nursery has stunning large wreaths as well as all of the natural resources you'd need to make one yourself. 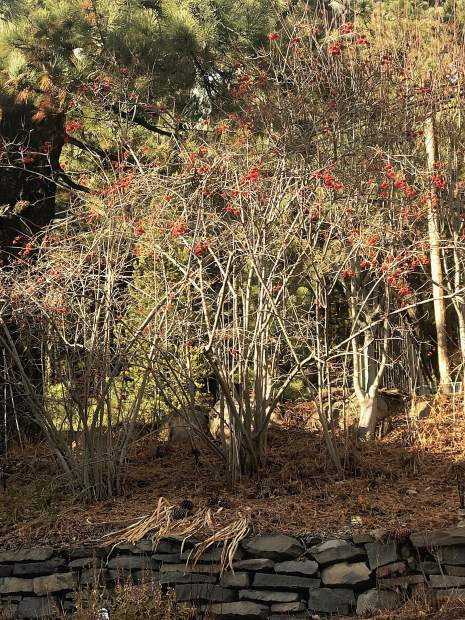 Larusson's favorite winter tree is the High Bush Cranberry, which displays these cheery red berries all year long. 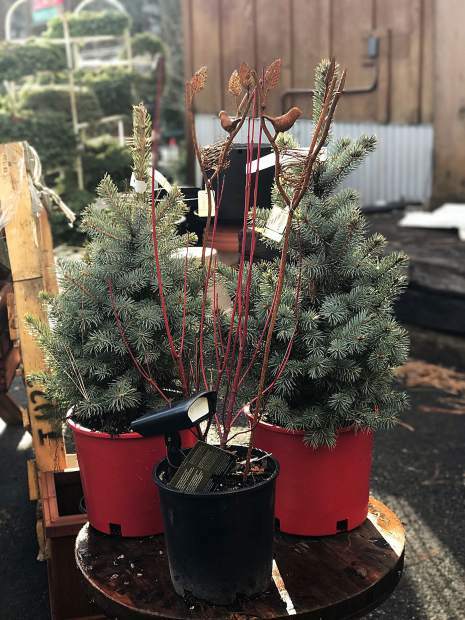 The Red Twig Dogwood plant makes for a lovely addition to your yard - its branches are a naturally vibrant red color and are beautiful in a snowy landscape. 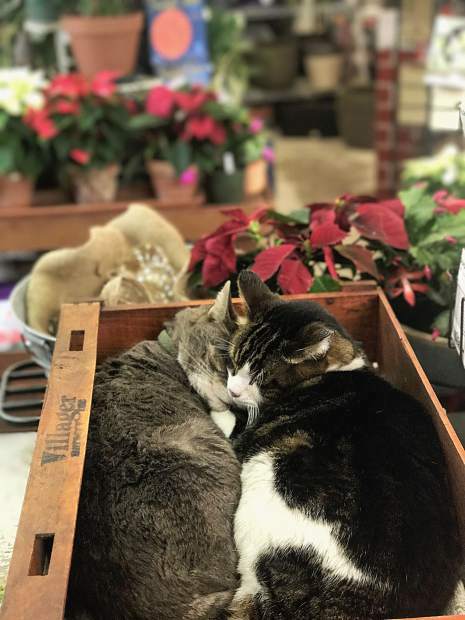 These shop cats are the highlight of everyone's visit inside the plant shop, they are adorable and clearly getting in the holiday spirit with all of the decorations around. 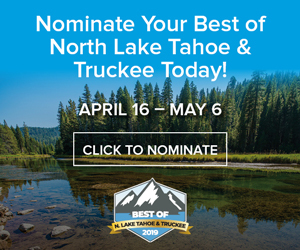 With the first of many snowy days upon North Lake Tahoe, it is officially time to prepare yourself, your home, and according to local plant experts, even your plants for storm systems ahead. 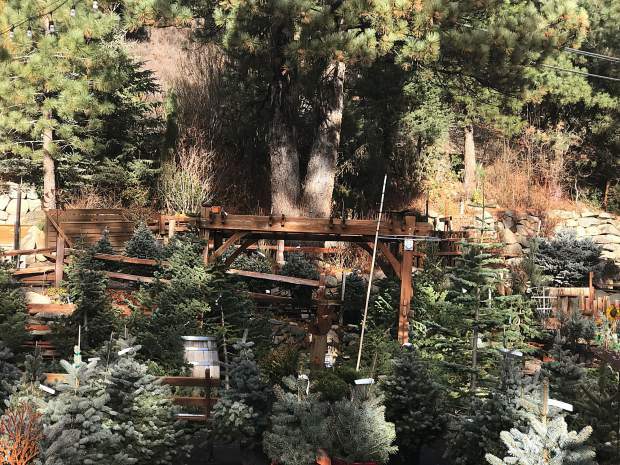 “Winterize your garden by harvesting, cleaning up, cutting back, staking, tying, wrapping, mulching, using organic or slow-release fertilizers and putting away tools,” said Eric Larusson, co-owner of the Villager Nursery in Truckee. He said while fall is the best time to plant trees, shrubs, perennials and bulbs; it is definitely the time to begin putting much of the garden to bed for the winter and bringing summer potted plants inside. 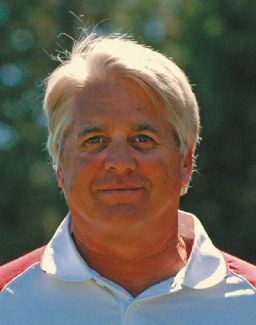 “Fall is the best time of the year for planting because the deciduous roots expand after the trees lose their leaves — that’s what feeds the plant. The leaves fall off, fall to the roots and the root systems take off, and that’s what keeps your plants going,” he explained. “Native plants naturally live year to year outside and survive by having root systems a thousand times bigger than their tops. 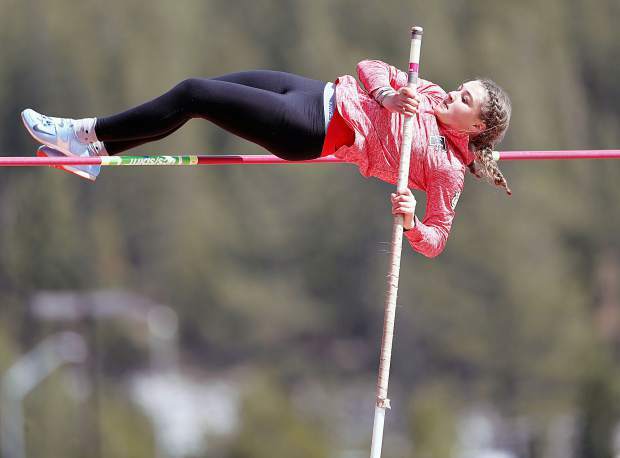 And conifer roots grow in early spring, around February or March,” he added. Larusson shared fun facts about all kinds of winter plants, and says summer isn’t the only time for dazzling landscape displays, as there are plenty of cold climate plants that are stunning as they emerge from freshly fallen snow. Below are Villager Nursery’s top five fun facts on winter plants. Villager Nursery recommends sticking with plants native to the area that have an interesting look to them for low maintenance and high enjoyment. Larusson is a fan of winter plants with berries like the snowberry plant. Plants with striking stem colors make for beautiful snowy landscapes. The Red Twig Dogwood’s branches are naturally a vibrant red and fun fact; their long and malleable stems are used for basket making. Larusson’s favorite tree is the High-Bush Cranberry, which he says has brought him more joy than the other trees because it prettily displaying bright red berries all year long. While summer plant care varies depending on species, there are a few basic tricks to keep your warmer weather plants happy this season. Say you have a few succulents that are looking droopier than you remember them back in August. Larusson says your best bet is to give them the brightest light possible, and as much of it as you can. Larusson says low maintenance houseplants are his kind of houseplants, and suggested Heartleaf Philodendron as a particularly easy plant to care for. If you are bringing succulents or other dry-climate plants, for example, indoors for the winter, be sure to water them hardly ever. Larusson recommends watering once per month since the plants aren’t growing as much during the winter’s shorter days. Close to January or February, he also adds seaweed to his plants, and said there is no need for additional nutrients during the cold spell. A favorite houseplant of Larusson’s is the Spathiphyllum with lovely rich green leaves, which will sprout white flowers in bright light. 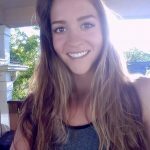 “Low maintenance plants are my kind of plants. I have two of these that were looking a little floppy, I gave them some water and they sprang right back to life,” he said. What better gift to bring a loved one this holiday season than a plant they can enjoy for months to come? “I’d bring a Poinsettia to a party, because it’s like a living bouquet that lasts longer than cut flowers. You could spend $40 on a bouquet of cut flowers that lasts one week, or buy a plant that lasts one to two months or years even, it’s cheaper and they last longer,” Larusson said. Other cheery plants that would make a charming gift this season are the Christmas Cactus with bright, festive leaves, and the Christmas Pepper, which grows colorful peppers that look like Christmas lights. If you’d like to get someone a fun and interactive gift, build a garden basket and gift them a variety of bulbs to plant and care for this season. 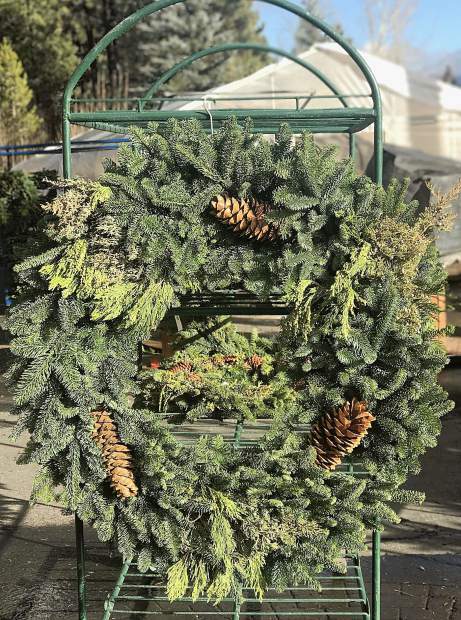 Villager also has a great selection of beautiful wreaths, pinecones, Christmas trees and more to decorate a home this season. When in doubt, the friendly staff at Villager Nursery is knowledgeable on native and non-native plants, and what works best in this region. 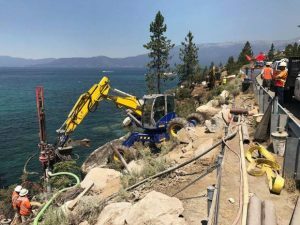 Larusson said his team is specialized in helping people of this area in search of plants that flower, provide lovely fall colors, help with screening or privacy and survive well in this environment. The nursery provides online resources and a running blog for gardeners to learn even more tricks of the trade, and keep their gardens flourishing year after year.